If you have ever spent time with children, you know that they have incredible imaginations. Whether they are telling you that the dog asked to share their mac and cheese, the hose in the backyard is magic, or that their stuffed animal came to life last night after you tucked them in, you can pretty much count on kids for an entertaining story. Unfortunately, that imagination doesn’t always prevent boredom, an affliction that plagues everyone as the long summer days roll into one another. Fortunately, there are some great adventure kits out there that can both inspire and enhance your children’s imagination. Just choose a kit that best fits your child’s personality, and keeps them entertained all summer! If your kid is super into bugs, then outfit them with this fantastic bug collection kit! 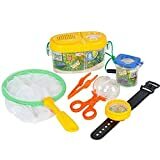 It contains a carrying case, a bug net, plastic tweezers, a bug globe that snaps closed like scissors, a compass watch, and a magnifying case. You can send your kid outside to discover beetles, butterflies, and lightning bugs. They are sure to stay entertained while enjoying the great outdoors. Bugs are super important to our environment, so this is a great opportunity for some educational play! One reviewer commented that her granddaughter has learned how to handle insects carefully thanks to this kit. This adventure kit is great to use in a bathtub, kiddie pool, or even in the shallow side of a full sized pool. It contains two magnetic fishing poles and thirty different kinds of magnetic fish. Just set the fish loose in your pool, and let your kid fish them up! This is a great way to get them interested in your fishing hobby at a level they can handle. You can also take this opportunity to teach them about marine life and the basics of fishing. You can even turn it into a competitive game since each kit comes with two poles! If your child enjoys being outdoors, then set them up with this adventure kit that will inspire a greater understanding of outdoor adventuring. 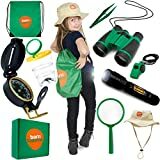 The nine-piece kit contains binoculars, a compass, a flashlight, a bug holder, a magnifying glass, a safari hat, a whistle, and a drawstring carrying bag. If you plan on visiting a local park or going on an easy hike this summer, make sure your child is set up with this outdoor exploration kit. That way, they can satisfy their curiosity and explore like a champ! Sandcastles are a beach day classic, but sometimes some kids need help and guidance getting started. 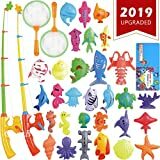 If your family plans on spending some time at the beach this summer, consider bringing this pack of sand molds with you. Teach your children how to form wet sand into their own little empire. This twelve-piece kit contains a lightweight bucket, eight sand molds, two toy turtles, and a small little boat to guide through the waves. As a bonus, it all comes packed in a clear plastic tote! Summertime means great weather. For a lot of people, great weather means camping. If you plan on packing up your car and spending a few nights in the great outdoors, you are going to need a way to entertain your children that doesn’t involve a screen. This adventure kit is a great way to keep kids engaged, entertained, and playing creatively for hours. The kit comes in a convenient storage bucket, and the toys included are enough for your child to build an imaginary camping adventure of their own. So remember your tent, sleeping bag, bug spray, and this adventure kit and you will be all set! If you are parenting a slightly more energetic child who isn’t interested in playing with small toys and would rather swing from the rafters, then give them their own life-sized kingdom to explore with this travel-friendly pop-up castle. Your children can run in circles, and chase each other into their safe haven. According to the manufacturer, this toy helps to develop important skills: “Sensory and Sensory Motor skills development is a major part of children’s early development. The pop-up tent and tunnel game is an excellent way to entice, and promote essential life and developmental skills in kids. Assimilating new information, Perception and using small and large muscle groups are all imperative elements in your child’s growth. The set offers an exciting way to develop all of these vital skills in a fun, learning environment.” So grab this pop-up adventure kit and keep your child entertained and tired out! This is an anti-adventure kit for parents. If your children are going to be running around and exploring the outdoors all summer, you are bound to face some scrapes and bruises. This first aid kit can help you keep your family on the mend! With 120 medical grade items in a compact, flexible carrying case, you will never be too far away from getting your little bugger off the ground and back out adventuring. Keep this close at hand this summer, and keep your family happy, healthy, and safe. Don’t forget a pair of binoculars and water shoes, just in case the sea calls to you. Have a great summer everyone!